The Cincinnati Zoo & Botanical Garden is embracing pollinator conservation through our Pollen Nation program. From butterflies and bees to hummingbirds and moths, pollinators are vital to the health of our environment. 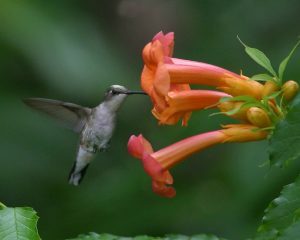 They also pollinate a third of the world’s crops and are critical to our agricultural system. Food connects all of us, and we have pollinators to thank for keeping our bellies full. 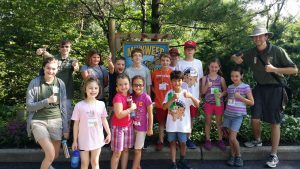 The Zoo is working to boost pollinator populations, which are in severe decline worldwide, right here in our own community. At Bowyer Farm, our 600-acre property in Warren County, we are propagating pollinator-friendly plants, restoring pollinator habitat, and helping out honeybees through bee-keeping. Our Horticulture team conducts trials to determine which plants benefit pollinators most in our region and partner with growers and local garden centers to promote and sell these selections as the Zoo’s Best Plants for Pollinators line. They also work with communities to establish pollinator gardens in public spaces. And we invite you to join us in increasing pollinator habitat in Cincinnati by taking the Plant for Pollinators Challenge. You can provide beautiful, vital habitat and enjoy colorful blooms all season that bring many beautiful butterflies to your yard. It’s easy to do. Whether planting just a few pots or a larger garden, you can do real conservation at home to support our pollinator friends as they do their job to keep our environment healthy. Together, we can make a big difference for our littlest friends and most important neighbors! The Cincinnati Zoo & Botanical Garden and Klosterman Bakery have teamed up to Save our Bees. A portion of your purchase of any Klosterman Rich ‘n Good Honey Bread, Buns or Rolls products will benefit the Cincinnati Zoo’s Pollen Nation program at Bowyer Farm, a 600-acre property in Warren County where honey bee hives have been established to boost the declining honey bee population, as well as raise awareness about conservation actions we can all take to Save Our Bees. Pollination is the process by which pollen is transferred from the anther (male part) to the stigma (female part) of the plant, thereby enabling fertilization and reproduction. This takes place in the angiosperms, the flower-bearing plants. 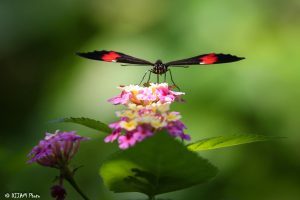 Pollination occurs when pollen is moved within flowers or carried from flower to flower by pollinating animals such as butterflies, birds, bees, and bats. The transfer of pollen in and between flowers of the same species leads to fertilization, and successful seed and fruit production for plants. 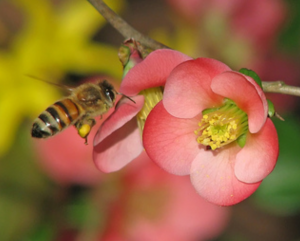 Pollination ensures that a plant will produce full-bodied fruit and a full set of viable seeds. Worldwide, roughly 1,000 plants grown for food, beverages, fibers, spices, and medicines need to be pollinated by animals in order to produce the goods on which we depend. Foods and beverages produced with the help of pollinators include: apples, blueberries, chocolate, coffee, melons, peaches, potatoes, pumpkins, vanilla, almonds, and tequila. In the United States, pollination by honey bees, native bees, and other insects produces $40 billion worth of products annually. Worldwide, there is disturbing evidence that pollinating animals have suffered from loss of habitat, chemical misuse, introduced and invasive plant and animal species, and diseases and parasites. 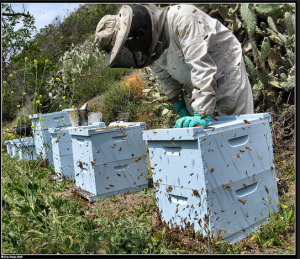 Colony collapse disorder (CCD) in the U.S. has lost over 50% of its managed honeybee colonies over the past 10 years. The causes of colony collapse disorder are unclear, but pesticides, malnutrition, mites and habitat problems such as a lack of native flowers available all play a role in CCD. Bees are undoubtedly the most abundant pollinators of flowering plants in our environment. While there are over 500 species of bees native to Ohio, a few species of larger bees can be seen regularly in the local garden, the honeybee, bumblebee, leaf-cutting bee and large mason bee. The service that bees and other pollinators provide allows nearly 70% of all flowering plants to reproduce; the fruits and seeds from insect pollinated plants account for over 30% of the foods and beverages that we consume. Butterflies and moths are also commonly seen pollinators. These animals are beautiful to observe and make a valuable contribution to the ecosystem though they are less efficient than bees at moving pollen between plants. Highly perched on their long thin legs, they do not pick up much pollen on their bodies and lack specialized structures for collecting it.